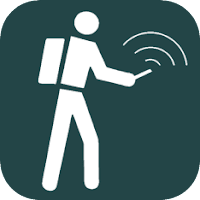 This app is a real navigation tool designed for outdoors sports like hiking, bushwalking, mountain biking, kayaking and trail riding. Its simple to use and works even in the remotest back country since it doesn’t need network connectivity. It allows you to work in UTM or lat/lon coordinates so you can use it with your paper topographic maps. Waypoints and track logs recorded in the field can be be viewed later in Google Earth.